Drug collection boxes that are being referred to as amnesty boxes have been setup at the three Las Vegas airports, in particular at McCarran International Airport where the majority of air travelers leave Las Vegas. The amnesty boxes are labeled, Disposal for Prescription and Recreational Drugs, and their intended purpose is to provide a means for travelers to dispose of any extra marijuana they may have purchased before they enter the airport. Clark County has made possession or advertising for marijuana at the airports illegal. Since marijuana is still illegal federally, crossing state lines with any form of cannabis is a federal offense and nearly everyone flying out of Las Vegas is going to another state. 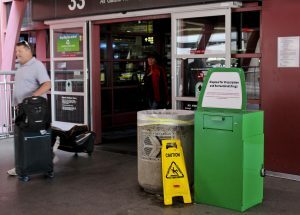 So to keep travelers from getting in trouble in the airport security line, big green bins — dubbed amnesty boxes — were set up a week ago outside McCarran, allowing people to toss their pot before catching their flight. Twenty of the boxes were installed at McCarran and its car rental facility, Henderson Executive Airport and the North Las Vegas Airport. The bins are about the size of a mailbox, bolted to the ground, monitored and designed to keep what’s tossed in them inside the box. In addition to pot, the bins can also be used to drop off prescription drugs. This is not the first time similar types of drug collection boxes have been installed in states. Colorado installed their own version of amnesty boxes in 2012 after recreational marijuana became available there. 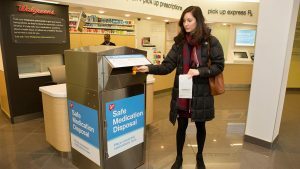 Arizona and Oregon have also installed medsafe medication disposal receptacles for people to get rid of all sorts of excess drugs they have. 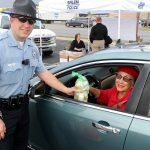 Programs have bee run by the DEA to inform people how to dispose of drugs responsibly and they created National Prescription Drug Take Back Days that occur in April and October each year throughout the United States. If you attend these events you will likely see a “drug take back” receptacle. 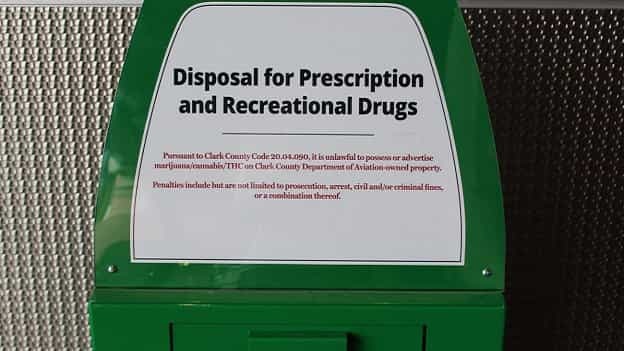 The intention of the Las Vegas amnesty boxes is to comply with federal law, but it is interesting that they have incorporated a nationwide effort to provide a responsible means to dispose of all types of drugs. It is not only a matter of prescription drugs getting into the hands of addicts and contributing to the overall opioid epidemic. There is such a thing as drug pollution and controlled substance disposal companies are used for the collection and responsible disposal of drugs to help the environmental effort as well. Many pharmacies will have a medsafe medication disposal bin for anyone looking for a place to dispose of their extra prescription drugs.